Keeping abreast of current thinking in almost any field of endeavour is a challenge. Health professionals, as an example, are often hard pressed to keep abreast of what is being published or reported – monitoring emerging trends or tracking what or who informs the decision or policy making processes. Generally speaking, a health professional’s scope of practice dictates to a greater or lesser extent what sources of information he or she accesses, for example, the newspapers they read, the journals to which they subscribe or the websites they visit on a regular basis. Unless undertaking a literature search, they may not readily appreciate the extent to which a given issue, subject or topic is receiving attention through one media or another. Complicating the situation is the fragmentation of information and news sources. Significantly, many issues specific to hospice and palliative care (PC) are universal in nature: in most countries, health care systems and social services face identical or at least similar challenges. What is happening, for example, in North America, Europe or Australia has relevance – either directly or indirectly – no matter in what country a health professional is practicing or their scope of practice. There’s information to be shared and lessons to be learned. 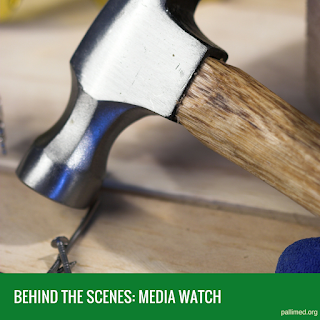 For the most part, it’s the news media – encompassing the Internet – that informs public opinion. It’s of critical importance, therefore, that health professionals are aware of what (or who) is shaping ideas and opinions, formulating policy ...and, to be sensitive to what may or may not inform a patient or family’s perception or point of view, particularly in the context of end-of-life care (EOLC) and the medical decision making process. My involvement in hospice and PC dates from 1985 and, as a communications consultant, I’ve been involved in or responsible for a broad range of initiatives at the community, regional, provincial and national level in Canada. As part of a college certificate program (beginning some years back), I encouraged my students – nurses, social workers and other health professionals – to bring to class any articles or reports on hospice or PC they happen to come across. The intent was to help students appreciate the topicality of the many EOLC issues addressed during the course, supplementing course readings and resources. Somewhat surprised, few responded. It become apparent that the students rarely paid much attention to the lay press and seem to have fairly limited access to the literature. I concluded, rightly or wrongly, that I was teaching a class not particularly well informed on “current thinking.” In an attempt to address this perception on my part, I began putting together a page of two summarizing the week’s news that I felt relevant and highlighting selected journal articles that crossed my desk. This is the somewhat modest beginning of Media Watch, which, over the past nine-years, has become international in scope and reach. The weekly report offers an overview of what is being reported on in the lay press and also published in specialist publications in the health, social and allied fields on issues specific to the provision and delivery of EOLC. It has evolved into an advocacy, research and teaching tool. Media Watch continues to be an important resource in the PC courses that I still teach. The weekly report adds currency to course content and, invariably, enhances discussion and encourages interaction, placing many issues, subjects or topics in a context to which students can more readily relate. My current work focuses primarily on advocacy and policy development in addressing issues specific to those living with a terminal illness – both patients and families (see ‘Communications with the Public, Politicians, and the News Media,’ Oxford Textbook of Palliative Medicine, 5th Edition) In recent years, I’ve applied my experience and knowledge to education, developing and teaching on-line and in-class college courses on different aspects of EOLC, and facilitating issue specific workshops, primarily for frontline care providers. Media Watch, or a link to the weekly report, is posted on a number of websites that serve the hospice and PC community-at-large, among them the International Palliative Care Resource Centre and the International Association for Hospice and Palliative Care, which highlights Media Watch in its monthly e-newsletter. Barry R. Ashpole is the editor of Media Watch, a weekly newsletter covering many areas of hospice and palliative care around the world.